The Bushnell Fusion 1600 ARC laser range finding binocular is revolutionary. I know that laser range finders are not new nor are laser range finding binoculars. However, for the first time you can buy a pair of laser range finding binoculars for under $1000 and that is what makes the Fusion 1600 revolutionary. For years, I have wondered why you can buy a high-quality rangefinder in a monocular model for $750, but buying binoculars with a rangefinder built into them ups the cost to $2300-$4000. When Bushnell introduced the Fusion 1600 laser range finding binocular at the 2010 shot show I was excited. Over the past few months, I had the opportunity to experience them first hand in a variety of situations. The result? I am even more enthusiastic about the Fusion 1600 binoculars. The range finding capabilities are exceptional. The fusion 1600 ARC emits invisible infrared energy pulses. The advanced digital microprocessor or arc receives the pulses and uses that data to calculate the distance. Ranging distance and accuracy is dependent upon many factors. I had no problem ranging any game sized animal at 1000 yards and any light condition. However, the color surface finish size and shape of the targets all affect reflectivity and range – the brighter the color, the longer the range. White is highly reflective, so it allows for longer ranges than the color black. The angle to the target also has an effect. Shooting to a target at a 90° angle where the target surfaces perpendicular to the flight path of the laser provides good ranging at further distances. I was able to range a Buffalo at 1500 yards. A target with a steep angle makes it harder for the pulses to make it back to the processor making ranging more difficult. Other things that affect ranging are light overcast skies during the day. I noticed better ranging during very sunny days. With that said, I have tremendous confidence in the ranging ability and accuracy during field hunting or target shooting. I love the concept of having an affordable rangefinder and binocular in one package. With the various testing on the ranging capabilities, overall the Bushnell Fusion 1600 gets the job done. I was impressed with the optics even though the Bushnell fusions do have a bluish tint. I am not exactly sure why, but the tint is definitely there. After using the range finding binocular in different situations I do conclude that the optical quality and clarity of the Bushnell fusion are excellent, but there are new optics coming out there it that just have better clarity, definition and crisp view. One aspect of the binocular that is top-notch – the design! Bushnell saw the importance of a great design with these binoculars. They have a very comfortable neck strap. When wearing these on a hunt, comfort is key. Weight is another important consideration and I found these to be no heavier than a regular pair of binoculars. They are waterproof and have RainGuard HD antifog coating. I found this useful during the early morning hours when regular binoculars might fog. Battery life is so-so for this item. Bushnell states you can range 8000 times before needing a new battery. I would recommend having a back up battery with you especially on a hunting trip. I’ve noticed in the past that extreme temperatures especially cold weather can affect battery life. Another design feature I enjoyed was the eyepiece attaching to the strap. They have a good fit and are easy to take off and get out-of-the-way when you need to look through the binoculars. 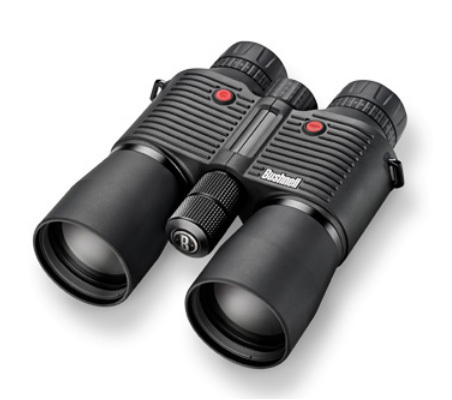 In addition the binoculars are very quiet and there is not an adjustment or action that makes any noise whatsoever. Bushnell did a fine job in designing these with the hunter in mind. I had the 10 X 42MM model but Bushnell also makes a 12 X 50MM model. I live in the South and the larger field of view was more important to me than the longer range of viewing provided by the 12 power. Even though my model was designed to range from 10 to 1600 yards, I was able to get distances beyond 1600 yards. How? The Bushnell Fusion utilizes arc angle range compensation technology. This takes into account the relationship between your target and your location. This is extremely beneficial in bow hunting. In fact, you can select bow mode or rifle mode. Both provide a true horizontal distance, line of sight and angle. During the test besides a traditional hunting experience and range day, we took the binoculars to Utah last year. 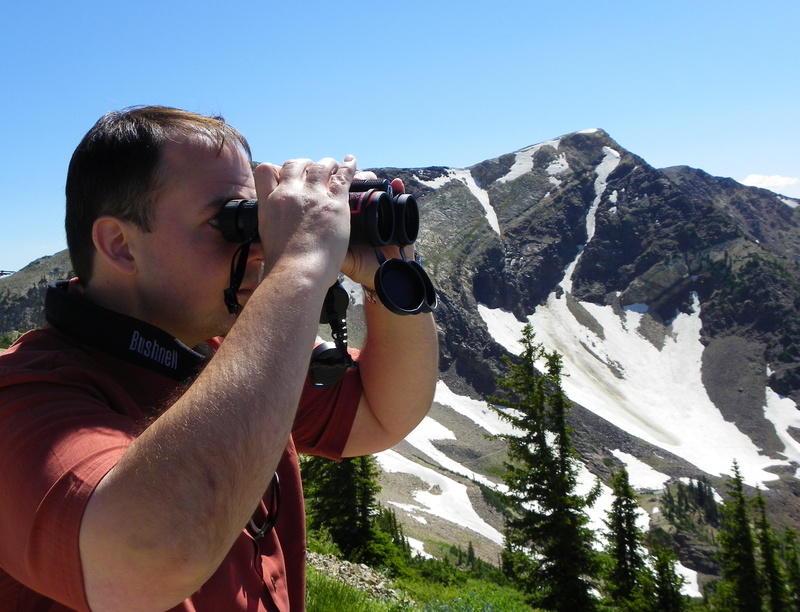 This trip offered two unique opportunities to test the Bushnell Fusion Arc range finder binoculars. 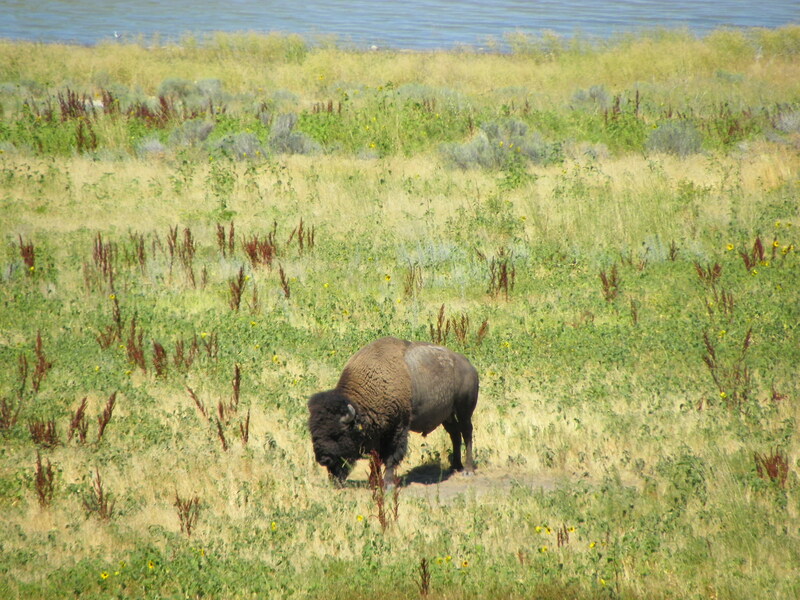 Buffalo at Antelope Island provided a good opportunity to range live animals. 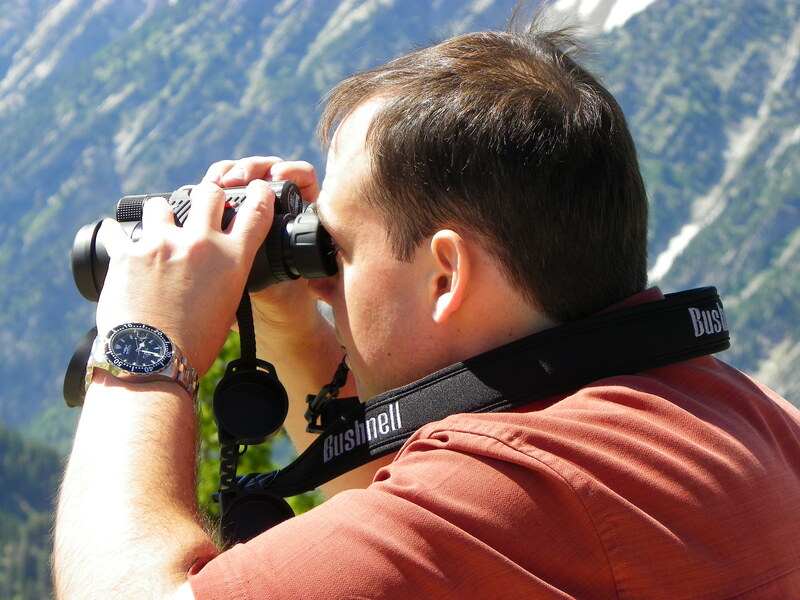 The first test was a day of sightseeing high up in the mountains at the Snowbird Ski Resort. We used the binoculars to look for wildlife and see the beautiful terrain close up. I was able to use the binoculars to range distances from the moving gondola as we went up the mountain. Even as a tourist, the Fusion Arc works wonderful. After Snowbird we drove to Antelope Island in the Great Salt Lake. Wild bison live on Antelope Island and I took full advantage of ranging the distance of the grazing buffalo from various locations on the island. Day one of the trip left me impressed with the versatility of the binoculars. 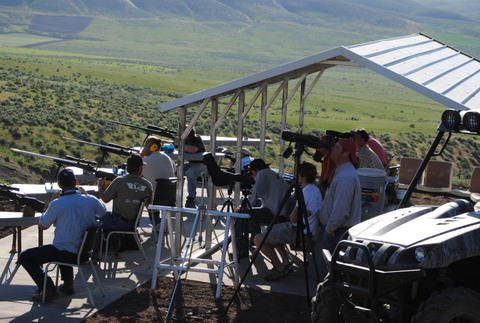 The second adventure was rifle golf at Spirit Ridge in Northern Utah. I know most of you may not have heard of rifle golf, but check out www.spiritridgeriflegolf.com to see what it is all about. Imagine golf with ATVs and long-range precision rifles instead of golf clubs. The course is made of 18 various shooting stations set with targets at long distances. You shoot at each of the 18 stations just like you would play 18 holes of golf. At each station is an animal shape at various distances. The vital areas are made of white steel plates. Your goal is to place a shot on that steel plate. The vital areas range from 4 to 12 inches in diameter. A good range finder to set up your shot is a must! Scoring works similar to golf: if get a hit on your first shot you get an eagle; if it takes two shots to hit the target you score a birdie; three shots is par; and as in golf a bogey would be four shots. From 200 to well over 1000 yards, your skill level is tested throughout the course. I understand my description of rifle golf in no way does it justice, but this was a perfect day to test the skills of my rifle, optic, ammunition and range finder. The targets are all at a set distances which allowed for me to test the accuracy of the Bushnell Fusion ARC binoculars. Just how accurate were they? Time after time I found them to be dead on accurate. A deer size target at 1000 yards? Not a problem! A buffalo at 1600 yards? Piece of cake. Overall, I feel for the money this is a good option to have. 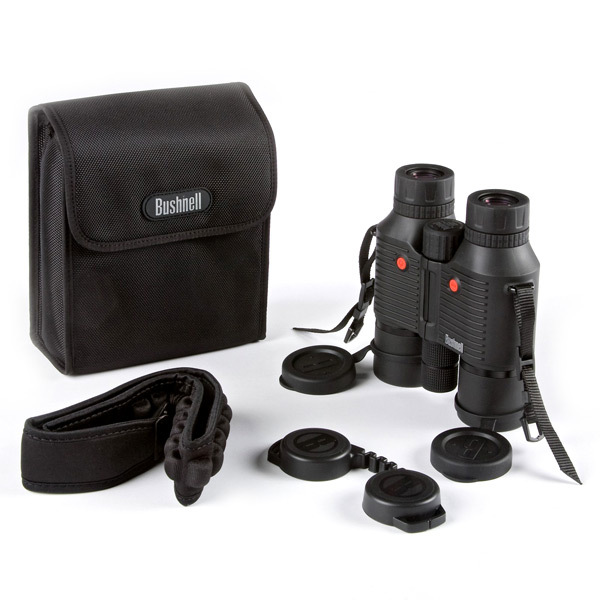 You have good quality binoculars and a very accurate range finder together in one unit. While the display can be hard to read in a very bright light, the ease of use and value cannot be beat. Simple, reliable and well designed. This entry was posted in Hunting, Product Reviews and tagged bushnell binoculars review, bushnell fusion 1600 arc rangefinder binoculars, bushnell rangefinder, bushnell rangefinder review, laser rangefinder, laser rangefinder binoculars, rangefinders. Bookmark the permalink.